Multiple people were shot tonight – 8 people are dead – at a shooing inside a Calhoun Street church. The Police Chief called this a hate crime. Emanuel AME Church is an historic black church in Charleston. Emanuel AME Church was targeted. The suspect was wearing a gray sweatshirt and blue jeans. Photos of the real shooter were released late Wednesday night. Police are responding to a report of a shooting at a Charleston church. The incident happened at about 9 p.m. at the Emanuel African Methodist Episcopal Church on Calhoun Street in downtown Charleston, police said. Charleston police have not confirmed any information on victims. According to WCIV, multiple people were shot. Police described the gunman as a white male wearing a gray sweatshirt and blue jeans. Police said he was approximately 21 years old. This was not the suspect. This man is a local reporter who was stopped by police at a convenience store. Charleston police have not cancelled their search for the gunman. The cuffed individual might not have been the shooter. 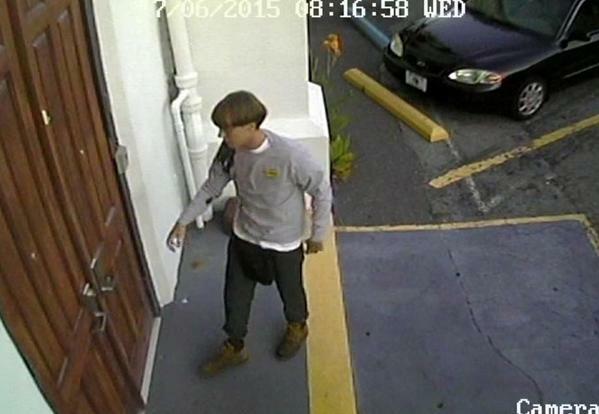 UPDATE: Charleston police chief says Nine people are dead. FBI and ATF are helping with the investigation. They are still searching for the individual. White male, 21 years old, sandy blond hair. They still haven’t found him. They tracked the individual with canines. There was also a bomb threat in the area.